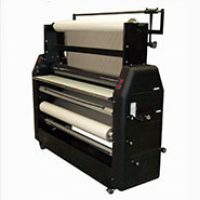 Our “Do-it-all-in-your-own-shop” Press Laminator/Slitter. This full featured, extremely useful press laminator/slitter is easy to use, economical to operate and delivers repeatable results! Laminates sheets and rolls with Thermoset, Thermoplastic, Peel & Stick or Hot Melt Adhesives. It is ideally suited for applying overlays or sealers, and can mate dissimilar surfaces up to 4” thick.